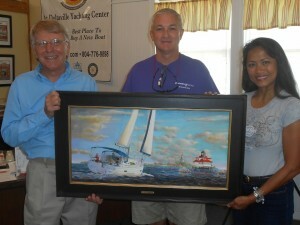 Deltaville Yachting Center proudly hosted Marine Artist, Lew Thatcher, as he presented Lourdes and Sean Neilan with the oil painting of which they commissioned Thatcher to complete. The beautiful oil painting of 2015 Catalina 445 “Mattapoisett” will hang in their home, where the Neilan family can see it every day! If you would like a cost estimate or details about having a commissioned oil painting of your boat, your boating memorabilia, a family boating picture, please contact Chesapeake Yacht Sales 804-776-9898 or info@dycboat.com. Lew Thatcher, marine artist, is happy to help with suggestions and photo shoots if you need either. He is great to work with and will guide you through the fun artistic process.